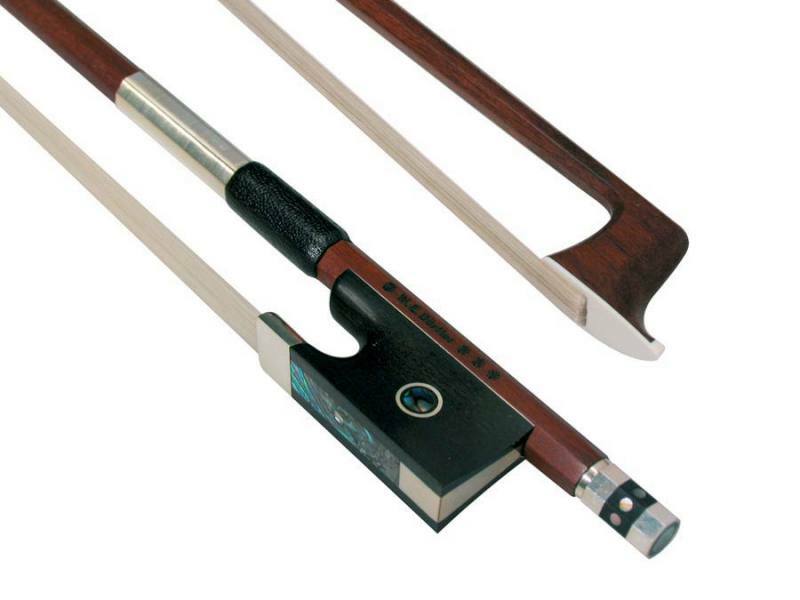 violin bow, 4/4, silver, pernambuco, octagonal 1a pernambuco stick, fine ebony frog, Parisian eye, three-part ebony button with eight inlaid eyes, silver wire winding An exceptional radiance arises from the play of the musician when he uses a brilliant Dörfler silver bow. A bow is just as important for the musician as the instrument which he must bring to sound. The sound quality of the string instrument can really be achieved only when both components match. For the Dörfler Master Bows only meticulously selected pernambuco sticks qualify which, through the expertise and year long experience of the master, are acceptable for use. Wonderful engravings, exceptional inlays and splendidly flamed gold fish slides embelish and make each bow to a unique item. For Dörfler's pernambuco bows only selected woods are used, which have been perfectly stored and dried for appromimately 30 years. Thanks to its, despite great hardness and density, excellent elasto- mechanics this wood type is the first, or more even the only, choice for bow making of a high standard. Pernambuco wood comes from northern and central east Brazil. The tree from which it is won is called Caesalpinia echinata, also known as Pau Brasil. SUSTAINED COMMITMENT: This rare tree species is listed under Cites 2* since June 2007, which means that the export is covered by far more effort than before. Dörfler is a member of the I.P.C.I. organisation, which takes care of the reforestation of this valuable tree species. However as the trees grow very slowly, it will take some time before they can be used for bow making.